Up your game for less…refresh your indoor and outdoor lifestyle for a fraction of retail! • You keep 65% of what your items sell for! • Register & enter your items online. • Checks mailed within 1 week. • We sell it for you. No haggling + no strangers coming to your house. All Things Home & Outdoor, Sports & Women’s Clothing at a Fraction of Retail! BUY and SELL in just 4 days! Earn 65% of what your items sell for. Shop before the public (best selection and prices) at our Consignor PreSale on Wednesday 1-8pm. You will get 2 PreSale passes when you drop off your items. Share one with a friend. Shop even earlier on Tuesday by working a volunteer shift (or two;). Cash your BIG FAT earnings check! And enjoy your clutter-free life! Checks are mailed within 1 week of the sale. Prep: Prepare your items by cleaning, organizing and packaging. A well presented item will sell quickly. All small parts must be well packaged. If selling a set, all items must be included and packaged together. Do not use packing tape over wood or decorative items. Use Magic Eraser to remove scuff marks. Tooth brushes are great for small corners. All items must be in New or Gently-Used condition. Out of date items will not be accepted. All items marked for donation will automatically be discounted in the system. The #1 reason for things not selling is the price is too high. Price them to sell! Tag: All items must have an ATG Pop-Up bar coded tag attached. Attach tags using packing tape, zip ties, pins or plastic wrap. If an item has multiple pieces/parts, notate on tag, and secure to primary item. Large items: print 3 tags and bring them with you to the Large Item Table. Prep, tag & price your items according to instructions. PREPARE your sale items by cleaning and organizing to make them look as close to new as possible. Log in with your consignor number and password. Enter your sale items into the inventory & tagging system. Print your bar coded tags and attach them to your items. Carefully read through the Prep, Price & Tag instructions & What Can I Sell guidelines. Any items that don’t meet our sale guidelines will not be accepted at drop off. Drop off your items at the sale location during your Drop Off appointment. DROP OFF your prepared & organized items at the sale during your designated Drop Off appointment time. To sign up for a Drop Off appointment, log into your consignor page and choose Drop Off from menu. Pick-up your unsold items (or even better, donate to charity) during designated Pick Up hours. PICK UP your unsold items at the end of the sale. Although we strongly recommend donating any unsold items, we understand wanting items back if they do not sell.We will be happy to donate them for you to local charities that serve families in need. Any items that haven’t been picked up by the end of the Pick Up time will be donated to charity. TO ENSURE A QUICK & EASY DROP OFF FOLLOW THESE STEPS TO ORGANIZE YOUR ITEMS! Consignors will be dropping off items at multiple check-in stations around the store, please organize your items by station: Testing Station, Kitchen, Decor, Sport, Outdoor & (NEW) Women’s Clothing. If you are consigning anything that uses power, take those items to the Testing Station FIRST. Consignors MUST make a drop off appointment. Sign up through your Consignor Homepage. Drop Off appointments are every 15 minutes. Use our handy Drop Off Checklist to ensure your items are prepped & tagged correctly and you are prepared for a smooth Drop Off appointment. Drop Off will take place at the sale location. Be prepared to put ALL of your items out on the sales floor. All items must be in New or Gently-Used condition. Complete with all parts and fully functional. Items intended to be in a complete set should come in a complete set. They need to be clean and free from any wear and tear. Electrical items will need to be tested at drop off. If picking up each unsold item is important to you, please print & bring a copy of your Unsold Items Report (make sure your inventory report is accurate though, no fun looking for something you never dropped off!). Sales reports updated by 5:00pm on Sunday. Pick up is Monday from 12-3pm & 4-7pm and Tuesday from 10am-1pm. Merchandise not picked up by the end of Pick Up (Tuesday at 1:00pm) will become the property of ATG Pop-Up and will be donated to charity. Please bring a wagon, bin, basket, etc. to help you collect your items. Sending someone else? If you’re unable to make the scheduled Pick Up time, you can make arrangements to have someone else pick up your items for you. Email us at Pop-up@astheygrowsale.com with “Pick Up Substitute” in the subject line and let us know who will be picking up your items. They’ll need your consignor # and ideally your Unsold Items Report so they know what to Pick Up. We only release checks to spouses with same last name. Shop early! Volunteer to shop early at the Volunteer Pre-Sale on Tuesday. Sign up through your Consignor Homepage. Volunteer details here. Savvy shoppers bring a large shopping bag, basket or wagon. Please inspect all items prior to checking out. TESTING STATION AVAILABLE. It’s not ideal to bring children to consignment sales events (due to the high volume of shoppers). However, if you must, we recommend using a stroller or baby carrier. Communal dressing rooms for trying on Women’s & Juniors clothing only. Purchasing large items is simple. Large items will have a “Large Item Claim Ticket” attached to them. To purchase, simply remove the bottom portion of the ticket and present at check out. Protect your items…we do not offer shopping bags, wrapping paper or boxes. To transport your items home, come prepared. We accept Visa, MasterCard, Discover & cash. All sales are final; products are purchased “as is”. 25% Off Saturday and LAST DAY SALE on Sunday – 50% off many items. 25 and 50% off items marked with (any color) dot on the tag. 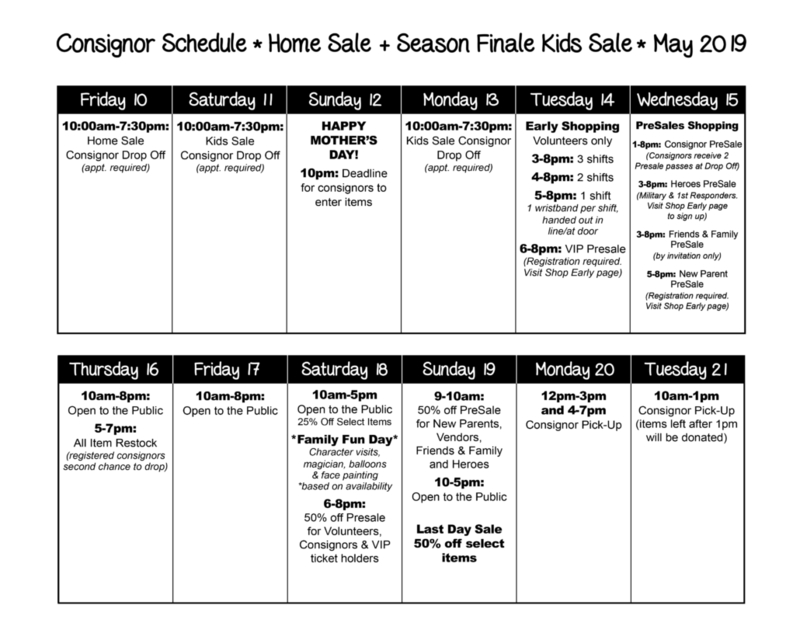 Check out the event calendar for ways to Pre-Shop. Look for our Pre-Sales!